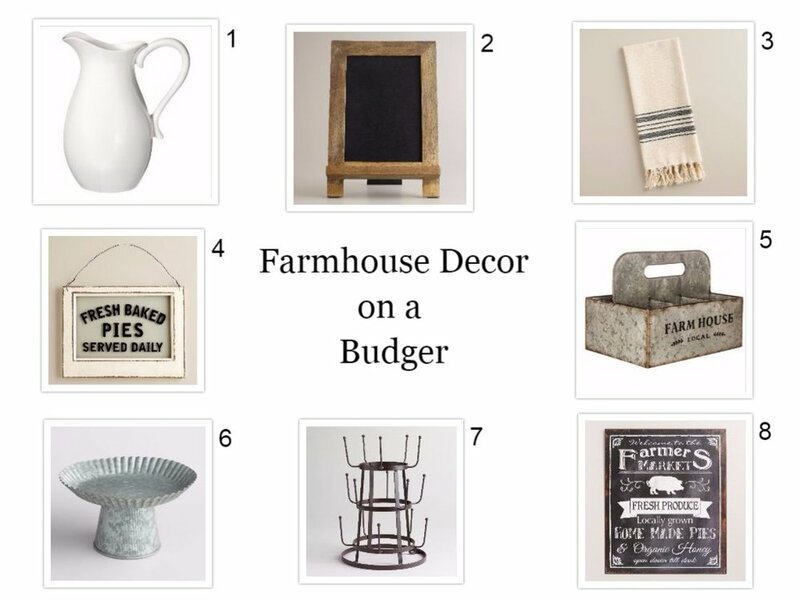 Farmhouse decor is so popular right now, but sometimes it can get expensive to buy some of the on trend items. I love to look for sales and I love a good deal. So I wanted to share some ways you can incorporate farmhouse style in your home without breaking the bank. I think everyone can appreciate getting the look for less! Here are some of my finds! Each of these items are under $20 and are from Target, World Market, and Hobby Lobby. I love shopping at these places when I'm looking for farmhouse style decor. Hobby Lobby is one of my favorites because they have %50 off certain items each week. I love to browse the aisles looking for different pieces and I always find something I love. A trend you see in a lot of these pieces I've picked is galvanized metal. This is an iconic farmhouse style material. Metal and wood are two things that scream farmhouse. Mix them, and you will have a beautifully decorated farmhouse style home. I hope this gave you some inspiration and helped you see that you don't have to spend a lot of money to achieve this popular look. If you would like some help finding some farmhouse pieces, or any other style pieces, check out my e-design page. I would love to help you create a space you love!